How horrified I was, when I received a phone call from a Humane Society stating that I had a dog there that was scheduled for euthanization!! I asked who had surrendered him but they weren't allowed to say. They did say they could tell me the dog's name though. Goliath! My beautiful gentle giant from my last litter in October 2010! My daughter had asked me if her family could have him because he was so gentle. I said if the next people who come would like to wait for the next litter, he's yours. Needless to say, the next people "fell in love with him". Ya, right! I like dogs better than people. The woman came several times to visit the litter waiting for them to reach 8 weeks old. She had all the right answers. " We'll never leave him alone outside. He'll be a family member. We have a 6 foot fence. Our last dog died at 14 years"... etc. etc. I made the two hour drive to the humane society in an hour and a half. No dog of mine is going to be euthanized!! What I found brought tears to my eyes. Literally. Poor Goliath was in a kennel totally covered in garbage bags so he couldn't see out. He was hiding under the bench, shaking and shivering. When I asked him why he was scheduled to be killed, they said he growled at them when they came in. Well ya! Here's this big, beautiful, gentle puppy scared out of his wits! He'd never been left alone before and, (get this) he'd never been socialized!! He growled at me when I went in but I knew he was just scared. I was willing to wait for him to adjust but one of the workers who had made a relationship with him walked right up to him and put my leash on him. He was sure ready and willling to get the heck outa Dodge! That dog sure knows how to pull! Up into the Jeep he jumped and he was quiet all the way home. Once home, I put him in one of the temporary kennels. It was then that I saw he had a misfigured left front leg. What the heck happened to my beautiful puppy? He was perfect and sound when he left here at 8 weeks. I called the society wondering if the owners had told them what happened to him. They said there was no info about it but they thought he may have been hit by a car and not taken to the vet. Needless to say, I was/am just livid about all this! Suing the owners for breech of contract comes to mind!!!! I've been racking my brain as to why I got so many emails saying he was such a wonderful dog, then when I return from holidays, I find out they've abandoned him. But I think I've figured it out now. They didn't train him one little bit! Nothing! Not a down, not a sit, not a "don't jump on me". Goliath weighs about 110 pounds. 110 pounds have happy dog who just can't keep his paws off your shoulders. Add this crazy, happy dog to a household who has added an infant into the mixture and there you have it. 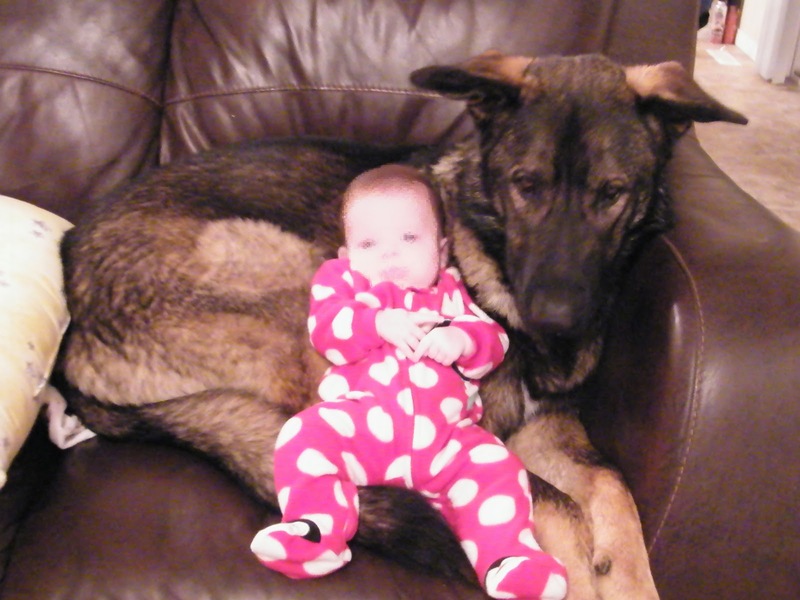 A dog who is impossible to handle near a baby. Or I should say "take for a walk" near a baby. You'll see why I corrected myself at the end of my rant. I was trying to figure out why they wouldn't just return him to me if they felt they couldn't keep him. Someone else figured it out for me. They were too embarassed to bring him back because he was obviously neglected. They went hours out of there way to drop him off at a humane society nowhere near where they lived. It all makes sense now. How pathetic and disgusting are these people. I could tell you what I hope for them in the future but I won't digress. I'm just happy the Humane Society read his microchip and contacted me. So the story has a happy middle. Not a happy ending because his story hasn't ended yet. It will end when I truly find him a forever home. Here is an opportunity to have a Guardian Angel Shepherd and do a good deed at the same time. The only charge will be for the cost of getting him out of the humane society. He is a beautiful, gentle soul. My daughter described him as "being beyond his years". As a young pup, he acted more like a 4 or 5 year old dog. Lots of play and exciting times outside, but bring him in and he would lie in front of the fire while we watched tv. Here is a picture I received from the owners 6 weeks before I rescued him. Definitely a dog that needs killing! NOT!! I took this picture to the Humane Society and they were appropriately appalled. The baby's face has been blurred to protect the baby. 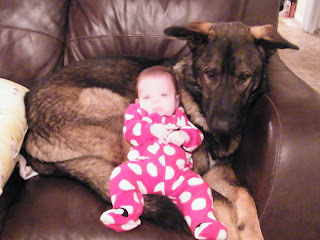 Below is a picture of my daughter with Goliath shortly before he went to his new home. So please help me create a happy ending for Goliath. Tell all the good-hearted, responsible, animal loving friends that you know. Let's all get together and make this a Happy New Year for Goliath. I would love to buy him, but I'm not in a situation where I could have a dog. 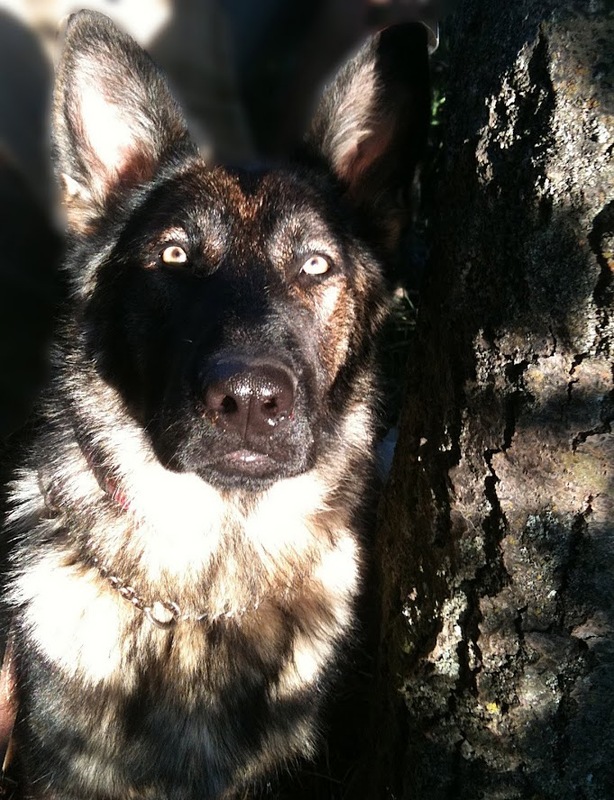 :( Which is a bit disheartening, as I really want to get a dog, specifically a german shepherd. Anyone who is thinking about getting any kind of dog, really needs to think about the situation they are in presently and in the future. In a year from now, will a dog fit into your life? What about 10 years from now? 15? You must be willing to take responsibility for the dog until it's dying day. If you can't say yes to all the above questions, please don't get a dog. Oh but let me at them!!! GRRRRR. My blood pressure rose and rose again. I pray Goliath gets a new forever home, and I'm so glad you were contacted. Bless him. I hear you. That's why I haven't gotten one yet.